We celebrated Mexico’s appearance in the World Cup with fish tacos and Coronas. We had this dinner the first time Mexico played on 13 June, but I didn’t take any photos so decided to feature them again. 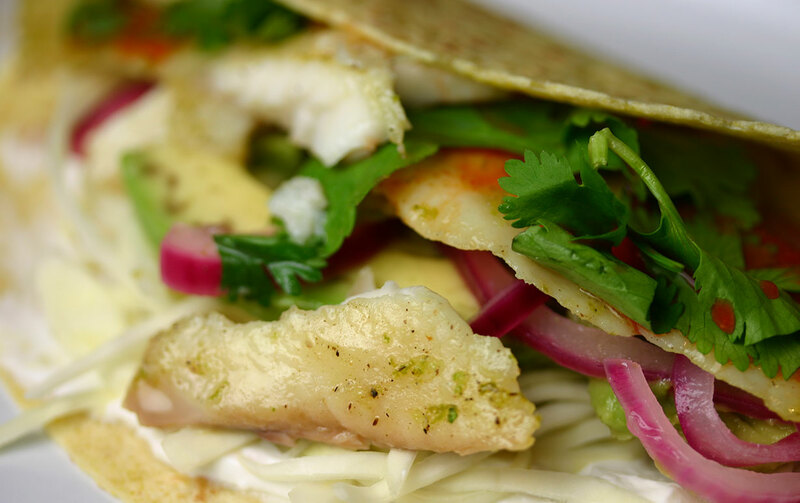 Actually, we have fish tacos pretty regularly — it being one of the few ways that Lyra will eat fish. I pretty much follow this recipe I found on the Love and Lemons website. Lie the tilapia fillets in a single layer on a dinner plate. In a small bowl, whisk together the tequila, olive oil, honey, lime zest, tabasco, salt and pepper. Pour over the tilapia, then turn the fillets. Set aside while you prepare the rest of the ingredients. Put the onion slices in a small bowl. Cover with boiling water, leave a minute or so, then drain and pat dry. Toss with salt and rice vinegar, and set aside. Slice the cabbage thinly and dress with a squeeze of lime juice and some salt. Do the same thing with the avocados. Heat the grill and cook the tilapia fillets for 3-4 minutes a side, or until cooked. Remove to a plate, squeeze some lime juice over them and leave to cool a bit. Heat the tortillas briefly under the grill, then serve with the fish, cabbage, avocado, onions, creme fraiche, coriander and hot sauce. I just put it all on the table and let everybody assemble their own, however they like.